The sixth Momentum, the Nordic Biennial of Contemporary Art, in the town of Moss in southern Norway opened its doors this June under the title “Imagine Being Here Now”. 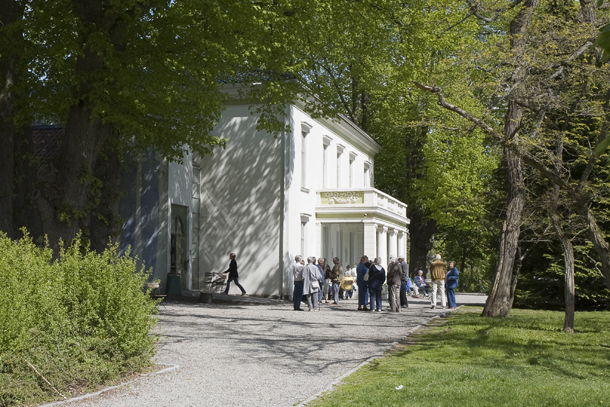 Five curators, corresponding to the five participating Nordic countries, organized the exhibition with fifty international participating artists in three venues: the Gallery F15, a historic countryside villa, Momentum Kunsthall, a former brewery in the city center of Moss, and the Solberg Tower, an empty high-rise building near the city of Moss. The biennial theme is decidedly not site-specific, and rather tries to provoke an intimate dialogue between the spectator audience and each individual work presented. This curatorial focus away from the site-specificity of the art event in the city of Moss, however, did not entirely preclude works that related their critical content through the context of the local. Most intriguing in this respect is the proposition by the Danish art collective Wooloo with a work titled “Two Years’ Untouched Garden”. Wooloo was founded by Martin Rosengaard and Sixten Kai Nielsen to offer a production platform and collaboration network for a contemporary art practice that can establish relations through a wide set of people as well as within manifold situations and socio-political realities, introducing an activist element into the production of art. Highly visible works of Wooloo have included the accommodation for about 3000 activists to the UN Climate Change conference in Copenhagen in 2009, New Life Residency at Manifesta 8, and a current project at the Venice Biennial. The later was initially commissioned as part of the Lebanese Pavilion to offer free accommodation for Lebanese artists. While Lebanon had to withdraw participation in the Biennial due to lack of funding, the Wooloo project went ahead nonetheless, shifting its offer for free accommodation to participants from other countries in economic need. In part it is this success through failure that makes Wooloo’s work most provocative and critical. While the official withdrawal of Lebanon highlighted the financial nature of the visible art world, Wooloo was able to disengage from the need to be “official” by utilizing the established networks between local Venetians and artists in need of accommodation. The work thus situated itself critically in the middle of the socio-economic realities of the international art market without being absorbed by its spectacle. It is this same logic of inaction officially promoted by the Norwegian government turned against itself that Wooloo appropriates in their proposition. And it is here where the fierce local opposition gains a symbolic momentum that reaches far beyond the local municipality. Bio: Matthias Neumann is an architect working in the extended field of building, thinking, researching, curating, writing and collaborating. He is the principal founder of normaldesign, based in Brooklyn, New York. His latest and ongoing project is Public Office for Architecture (www.public-office.org).